Heat oven to 375°F. 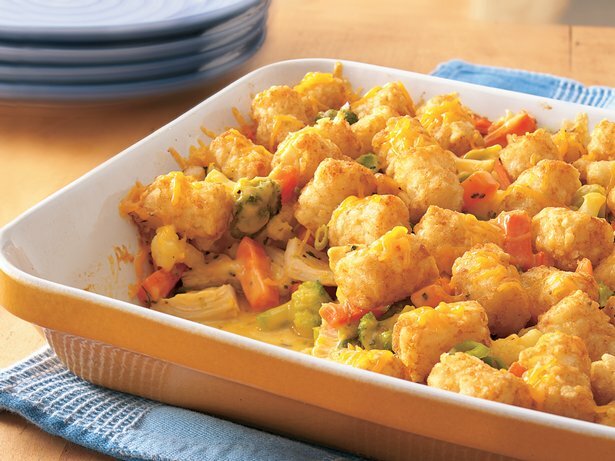 In ungreased 11×7-inch (2-quart) glass baking dish, place broccoli, carrots, cauliflower and cheese sauce. Microwave uncovered on High 3 to 5 minutes, stirring once, until thawed. Stir well until cheese sauce is melted. Stir chicken and 3 tablespoons of the onions into vegetable-cheese mixture. Top with frozen potato nuggets. Bake uncovered 40 to 45 minutes or until bubbly around edges and potato nuggets are golden brown. Sprinkle with cheese and remaining 1 tablespoon onion. Bake 5 to 10 minutes longer or until cheese is melted.